Have the Americans actually embraced the pluralism that exists within their country, or is xenophobia and racism the norm in their society? One would expect the multicultural and cosmopolitan American society to appreciate such gestures. However, the reactions to the recitation of the Pledge in Arabic spoke otherwise: the language in itself was described to be meant for terrorists, and associated with Islam. Such bigotry once again highlighted everything that is wrong with USA: xenophobia, racism, ignorance, violence and above all, Islamophobia. Pine Bush is a small town located roughly 85 miles from New York City. It is predominantly white, with Arab and/or Muslim-American populations being negligible. The Foreign Language Week was an attempt undertaken by Pine Bush High School to foster cultural integration and interaction. It was an occasion to celebrate the multiple tongues, cultures and events that make up the human civilization in total. Arabic, as a language, did not kill any of their family members. Arabic, as a language, hardly has any proper speakers in Afghanistan. On any given day, such opposition to Arabic would sound ridiculous. However, a good portion of the American media as well as political outfits described the recitation of the Pledge in Arabic as a threat to USA, thereby incorrectly viewing Arabic as the language of terrorism, spoken by enemies of freedom. The Clash of Civilizations rhetoric was propagated once again: Arabic, much like every other Asian language, is theirs, not ours. However, even more unfortunate was the fact that instead of ignoring such baseless talks, the Principal of Pine Bush High School decided to apologize for the recital. Will not this apology convey to the students a wrong idea that reciting the Pledge in Arabic was indeed an unpatriotic and unlawful act? The Pine Bush controversy once again sparked discussions about the old question: is USA truly multicultural? Have the Americans actually embraced the pluralism that exists within their country, or is xenophobia and racism the norm in their society? Furthermore, this controversy did not occur in isolation. Recently, New York City decided to observe some Muslim holidays as well, and the responses to this decision too were a mixed bag. The opposition to the Pledge in Arabic shows one key point: in spite of its multicultural nature, America does view garments, languages and probably even cuisines as not merely cultural symbols, but signs of religious, ethnic and racial identities. Arabic was just one side of the coin: Chinese, Japanese, Russian and even Spanish would be considered foreign. On the other hand, languages such as Italian or French would not have stirred such a big controversy. Because no matter what you say, racism is selective and biased. Arabic and Chinese are foreign because anything related to the Orient is suspicious for the American masses. Russian is foreign because Russia in itself is suspicious for Americans. Spanish is foreign (even though a good number of Americans speak Spanish as their first language) because of deep-rooted racism and xenophobia in the American society. This is precisely why the recital of the Pledge in Arabic led to nationwide hysteria and outrage. A sense of hostility is deep-rooted in the American system: Afghanistan, a country that does not speak Arabic, can be blamed for Arabic, if need be. 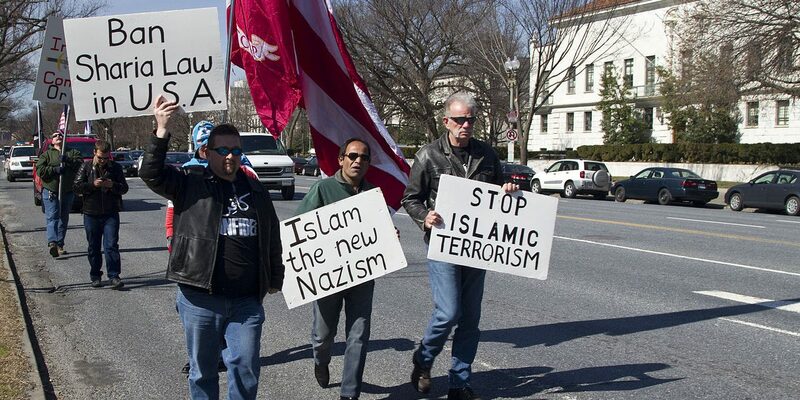 Islamophobia is on the rise in USA, and the Pine Bush incident only affirms this fact. As such, NYC’s decision to acknowledge Islamic holidays, as good as it might sound, will still continue to be overshadowed by such Islamophobic and ignorant gestures. Sufyan bin Uzayr is a writer and analyst who focuses on current affairs. His op-eds often expose the atrocities being committed against the minorities, such as the Rohingya people of Myanmar or the ethnic tensions in South Sudan and CAR. Sufyan bin Uzayr is a published author and an experienced web developer. Read his blog at www.politicalperiscope.com.